Various sensors ensure that parts are present and correctly oriented. A leak tester checks the final assembly. A surprising amount of two-component liquid polymers are used in healthcare. Dentists use them to fill cavities and bond crowns and inlays. Surgeons use them to bond blood vessels, tissue and orthopedic implants. Audiologists use two-part polymers to make custom-fit hearing aids. To help healthcare personnel mix and dispense these thick materials accurately and economically, TAH Industries, Inc. (Robbinsville, NJ) recently introduced a single-use, 1 milliliter package called the u-TAH Nano. The product's success hinges on the ability of TAH to assemble it at an attractive price while maintaining acceptable margins. Automation was the best — indeed, the only way to achieve those goals. TAH turned to systems integrator Dial-X Automated Equipment, Inc. (Albion, IN) for help. Working closely with TAH's internal automation team, Dial-X designed a 16-station, fully automatic rotary indexing system. The system was installed at TAH's facility in January. In this profile, Curt Bonar, president of Dial-X describes the system. For more information on dispensing equipment for medical as well as industrial adhesives and polymers, call TAH at 800-257-5238 or visit www.tah.com. What are the dimensions of the finished assembly? 0.375 inch in diameter and 2 inches long. How many parts are assembled to complete the product? Five plastic parts. What equipment feeds the parts? The parts are fed with five vibratory feeder bowls, which we built ourselves in-house. Storage hoppers keep the bowls supplied with parts. Vibratory in-line feeders take singulated and oriented parts out from the bowls. Pick-and-place units take them from there. What methods are used to assemble the product? The components are rotated to the correct orientation and then pressed together. What checks or inspections are included in the assembly process? Various sensors and proximity switches ensure that parts are present and correctly oriented. A leak tester checks the final assembly. What is the production rate? One part every 3.5 seconds. Did you help the customer design the product for efficient automated assembly? Yes, a few modifications were made to the product so the parts could be easily fed from the feeder bowls. Can the system accommodate product variants? Yes, to a certain extent. The bowls and in-line tracks have adjustable tooling. What was the most challenging aspect of designing and building the assembly system? Coming up with a method to feed and assemble the small delicate parts without damaging them. With 37 years of experience in engineering and feeder bowl assembly, we designed precision tooling and feeders to handle the job. You're at the dentist. Your mouth is open, he's probing around with his mirror and tools, and you'd rather be anywhere else but in that chair. Well, take heart: At least you'll know how that mirror was assembled. Systems integrator and bowl manufacturer Dial-X Automated Equipment, Inc. (Albion, IN) recently designed and built an automated assembly system for a dental mirror. The system was built on a walking beam chassis. Feeding the plastic handle for the mirror would be a challenge. Five inches long and 0.5 inch in diameter, the handle was shaped for ergonomics and utility - not for automated assembly. 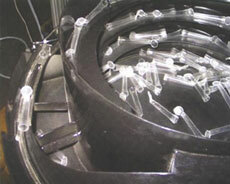 Dial-X designed a vibratory bowl and conveyor to feed the parts. The handles are fed end to end, with the mirror end leading. The feeder supplies one handle every 3 seconds. "The bowl was coated with urethane to prevent scratching and scuffs," explains Curt Bonar, president of Dial-X. "Due to the shape of the handle, special tooling was installed to assist with the orientation." PHD can help simplify complex automation design. Use our building block components and tools to build your modular automation solutions. This Series 160 Escapement provides a simple and reliable means of isolation and releasing parts from various types of conveyor or vibratory feeding systems. Series SA and Series SD Slides and Series 8400 Angular Gripper create a simple and cost-effective pick and place automated machine loader. PHD slides, rotary actuator, gripper and escapement perform part transfer, orientation, and clamping functions. Dial-X Automated Equipment provides single-source machine-building and integration services for pharmaceutical, food and beverage, automotive, and consumer goods manufacturing applications. To develop a connector assembly verification system based on machine vision, Dial-X assembled and tested all equipment in-house, installing the equipment at the customer's plant, and providing product support throughout the machine's lifecycle. For the connector inspection system, Dial-X used 11 Presence-PLUS cameras from Banner Engineering (Minneapolis, MN, USA), along with two spotlights, a backlight, and an on-axis light. 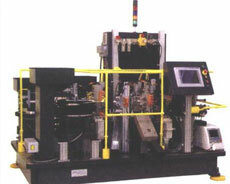 Each lighting type was selected for the machine depending on the connector part to be inspected. 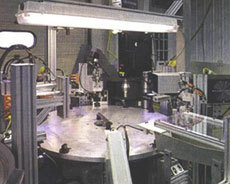 The components were sold to Dial-X by C&E Sales (Dayton, OH, USA), a provider of automation solutions. "If we're verifying the connector's shape, we'll use a backlight to create a silhouette of the product," says Ryan Berkes, Dial-X project manager. "For verifying color, we'll use a spotlight to highlight the front part of the connector. The on-axis light is used to mute the color of one of four internal connector parts. This allows us to measure and verify that two parts are assembled correctly." Dial-X attends various tradeshows throughout the country. Check back for a list of upcoming tradeshows we will be attending.